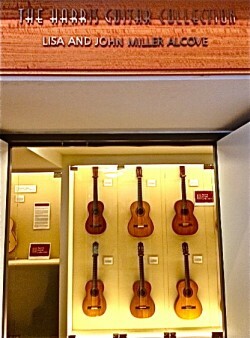 The Harris Guitar Foundation is a 501 (c) (3) public charity built around an important collection of classical and flamenco guitars, the Harris Guitar Collection, showcased at the San Francisco Conservatory of Music. HGF is linked as a “supporting” organization to SFCM and to the OMNI Foundation for the Performing Arts. HFG’s mission is to support SFCM’s world-famous classical guitar program and the OMNI Foundation’s award-winning series of guitar concerts by making the Collection available for a variety of uses in the classroom, on stage and in the recording studio. The Harris Guitar Collection: At the very heart of HGF’s role at the SFCM is the use of the Harris Guitar Collection by the students who, often for the first time, are able to hear and perform on instruments made by the great historical luthiers who developed the instrument we know today–luthier’s like Torres, Santos, Ramirez, Hauser, Fleta and Bouchet, just to name a few of the iconic makers represented in the Collection. In a dramatic 18-foot glass display case, a rotating selection of guitars from the Collection’s 30-plus instruments are on display. 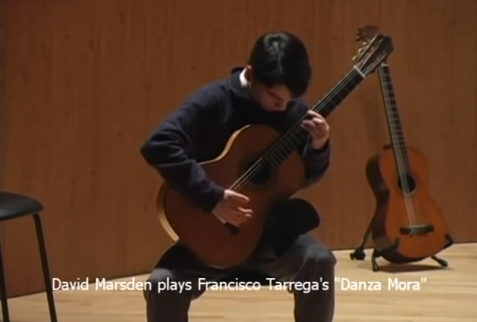 Video: Guitar student David Marsden performs on the Collection’s 1888 Antonio de Torres at Guitarrada V. Click to view. The Omni Foundation: In collaboration with our second supported organization, the Omni Foundation for the Performing Arts, HGF has an opportunity to work with the visiting artists presented in OMNI’s award-winning concert series. HGF and OMNI are in discussions to produce smaller salon concert venues for OMNI’s world-class artists who will perform on historic guitars in an intimate setting where the qualities of these guitars shine the most. Conservation Criteria: Finally, HGF, working closely with SFCM’s guitar faculty, will apply strict conservation criteria to the display and use of the Collection. By keeping the Collection’s instruments secure and in top playable condition, their important role as musical tools will never take ‘second fiddle’ to their role as cultural artifacts.